Copyright (c) – Nettoverboard Publishing Ltd.
Made By – Nettwerk Productions Ltd. Manufactured By – Nettwerk Productions Ltd. Title as on spine: "Twelve Inch Anthology"
Title as on cover: "12 Inch Anthology"
Title as on disc face: "12" Anthology"
All songs ℗ © Nettwerk Productions Ltd 1985 - 1989. All rights reserved. When I got this in 1990 I just started to buy Skinny Puppy CDs (had and still have all the previous releases on cassettes). Although there are some of the early classics on here (The Choke, Assimilate, Addiction, Testure especially) there is no reason to own this if you have the original full lengths. First off the songs do not flow well together. Lets face it, SP don't do greatest hits well (only good one being the B-sides collect as being a anthology of the more experimental thoughts tucked in on singles as b sides). 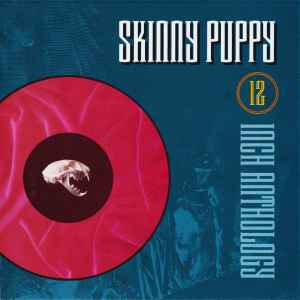 Skinny Puppy should not be greatest hits and having them as late 80's extended mixes or just edits, it's very dull. Secondly need to mention they are the lesser versions than the originals. Good lord trying to listen through 2 versions of Stairs and Flowers which may be the worst SP song of all time. You are saying these are 12" singles all collected on one record? Ok. Still it's a difficult listen through all the way. Hard to listen to 10 straight 6-9 minutes of editing extended versions. Just a poor release.